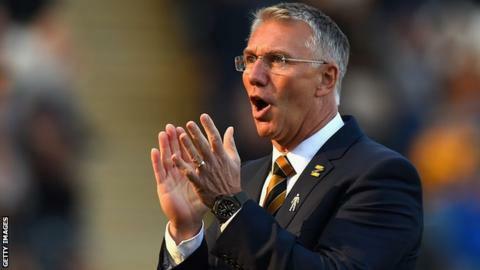 Hull City boss Nigel Adkins will consider a new contract to remain at the Championship club. The 54-year-old has been in charge of the Tigers since December 2017, but his initial 18-month deal expires at the end of this season. "This is the first stage - that there has been something offered," he told BBC Radio Humberside. "I am looking at the whole picture of where we are moving as a football club, and I think that is important." Former Southampton and Reading manager Adkins led Hull to 18th place in the second tier last season. After a poor start to the current campaign, they are now 12th, six points off the play-offs, with eight games remaining. Adkins says the future direction of the club will play a part in whether he decides to stay at the KCOM Stadium - with owner Assem Allam having received offers for the club. "I am ambitious. I am 54 now and am not at the end of my career," said Adkins. "I am coming into the prime of my career and I want us to do well. Therefore you turn around and go 'what is success?'. "I have been in this position before with other clubs where there was a lot of things going on behind the scenes. "You do all the donkey work, you keep everything going and then new owners come in and it is 'goodnight and God bless'. "The important thing is I really enjoy being up in Hull, I have enjoyed being at the club and I am appreciative there has been a proposal. That will now just be dealt with privately."